Can the Bay Bank Help Save Family Farms? Family farmers try to give as much to the land as they take, but that makes it tough to compete against less-responsible industrial farms. 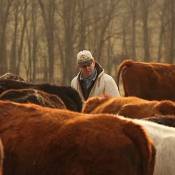 Here’s how a West Virginia farmer and the Pinchot Institute aim to make his stewardship pay off – in the form of ecosystem service and voluntary credits featured on the Bay Bank. It’s a philosophy that he says grows out of farmers’ desire to create a legacy that keeps on giving for future generations, and it’s one he says his own family has always followed in everything from planting crops to installing feed lots. It’s also a philosophy that doesn’t necessarily pay off in today’s modern economy, as Rudolph learned when he saw a number of properties transformed from farms to housing developments. For him, that would be a betrayal of his own parents’ legacy. That is difficult to ensure, especially if the farm went through an economically difficult time — as many farms do. But the family found a way to gain some assurance when they were presented with the opportunity to adopt a land management plan that would generate ecosystem service and Voluntary Habitat Credits under the Pinchot Institute’s Bay Bank model. Nancy Ailes first told them of the opportunity. A longtime presence in the community, she is also Executive Director of the Cacapon and Lost Rivers Land Trust and saw the Bay Bank as an opportunity that would meet the revenue needs for the Rudolph family while still ensuring the conservation of the land. The stewardship has paid off — the property still contains old-growth forest and intact floodplains along the trout stream. The management plan focuses on protecting and nurturing these rare characteristics and other land characteristics important to sustainable land management, generating credits for the Bay Bank marketplace. With the aim of improving the health of the Chesapeake Bay watershed, this marketplace will sell credits and connect farm and forest landowners with ecosystem markets and conservation-minded funders. The Bay Bank needs to ensure a robust demand for the credits for the marketplace to succeed—especially since the voluntary habitat credits are unique. This is a challenge for the Bay Bank team; we explore it at greater depth in Part Two of this story. But the Bay Bank continues to build up the supply side, helping private landowners understand the credit possibilities on their land. This is essential in the Chesapeake Bay watershed, where private landowners own the majority of the land. In fact, there has been a 25% increase in the number of family forest landowners in the Bay Watershed. Any conservation work in the area needs to involve a relationship with this group. The Bay Bank began with the idea that they could link these millions of landowners with service providers that can assist them through the process of understanding the value of their property. The group encourages landowners to adopt sustainable land management practices that benefit water quality, mitigate climate change and improve ecosystem health as well as protect existing natural processes. If done right, these conservation practices can generate ecosystem service and voluntary habitat credits. However, a number of landowners are unaware that conservation can provide this alternative source of revenue. For the Rudolphs, Ailes was there to point them to the resources, but not all landowners are so connected. And even if landowners know about existing credit programs, the process of generating and selling credits is complex and intimidating. Landowners need partners that are willing to help them through the process. The first step in this type of conservation is to determine if a property is a good fit for habitat and ecosystem credits. To gather information on their property, landowners in Maryland and Delaware can use LandServer, a tool developed by the Pinchot Institute. With this tool, they can zoom into their property and receive a quick conservation assessment, evaluating the potential for instituting land practices that would result in ecosystem service credits—including the Bay Bank’s unique voluntary habitat credits. Soon, the tool will expand to Virginia and Pennsylvania. The LandServer data includes information about landscape aspects like priority areas for nitrogen and phosphorous reductions and riparian forests. More importantly, the tool contains context for this information to help landowners understand what these characteristics mean for the watershed. Once up and running, the Bay Bank will feature a regional, multi-credit ecosystem service platform based upon existing national, state and local markets, efficiently connecting landowners with potential capital. Credits featured on the marketplace will include carbon sequestration, water quality protection, forest conservation, habitat conservation and traditional conservation programs. The Bay Bank will also provide landowners with a greater context to understand if a conservation credit approach is right for that property. This includes information such as what it means to establish a forest bank, the costs associated with planting trees and the expected income from credits. If landowners decide they do want proceed, they can utilize the Bay Bank’s service provider matching tool. Service providers will partner with landowners to support them in this process, developing a land management plan and negotiating with potential buyers. To establish this database of service providers and become a marketplace for voluntary credits, the Pinchot Institute built partnerships with groups across the watershed. These essential partnerships helped them to develop an understanding of the current credit opportunities, existing programs and the possibilities to streamline this process. The Cacapon Rivers Land Trust and Trout Unlimited are currently two of their primary partners that will help support land owners through this process. Landowners interested in building partnerships can pursue service providers or wait to see if anyone is interested in working with them by posting a description of their property online. And if the right partnership is found through the Bay Bank, that habitat conservation can have big dividends for the landowner in the form of ecosystem and voluntary habitat credits. But before the landowners can cash in, protocols and demand for these habitat credits must be developed. Learn about the Pinchot Institute’s work in this area in Part Two. Hannah Kett is an editorial assistant with Ecosystem Marketplace and a free-lance journalist focused on the non-profit sector.Ã‚Â She can be reached at hkett@ecosystemmarketplace.com.